To view and print a promotional flyer for Dr. Brooke's book, The Use of the Creative Therapies with Sexual Abuse Survivors, Click here. Brooke, S.L. (In press). Domestic violence: An analysis of the crime and punishment of intimate partner abuse. In J. Kitaeff (Ed. ), Handbook of police psychology, 2nd ed. NY, NewYork: Routeledge. Brooke, S.L. (Ed.). (2017). Combining the creative therapies with technology. Springfield, IL: Charles C. Thomas Publishers. Brooke, S.L., & Miraglia, D.A. (Eds.). (2016). 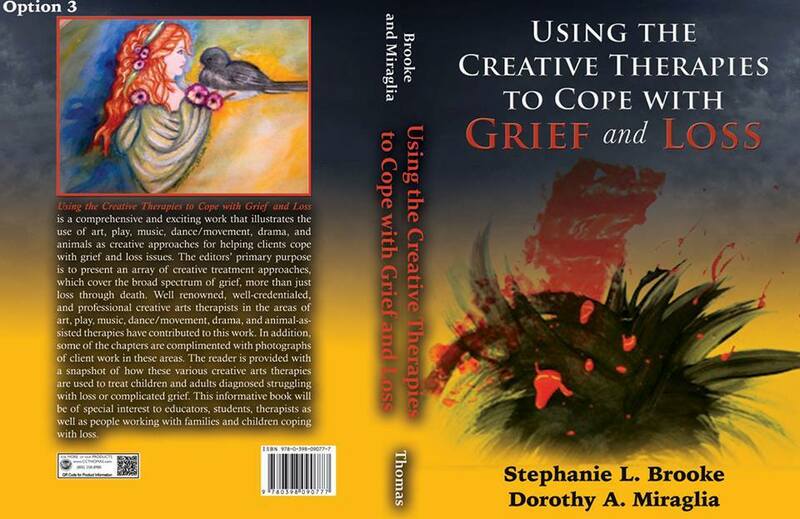 The use of the creative therapies in treating grief/loss. Springfield, IL: Charles C. Thomas Publishers. Brooke, S.L., & Myers, C.E. (Eds.). (2015). 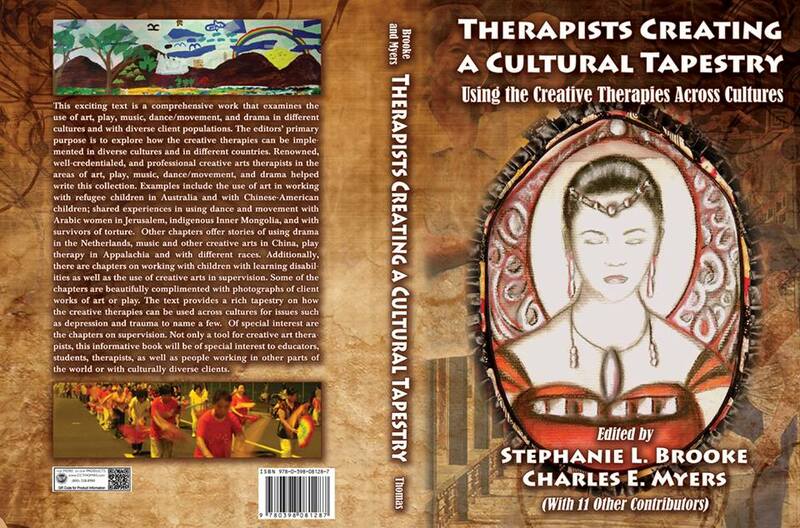 Therapists creating a cultural tapestry: Using the creative therapies across cultures. Springfield, IL: Charles C. Thomas Publishers. Brooke, S.L., & Myers, C.E. (Eds.). (2015). 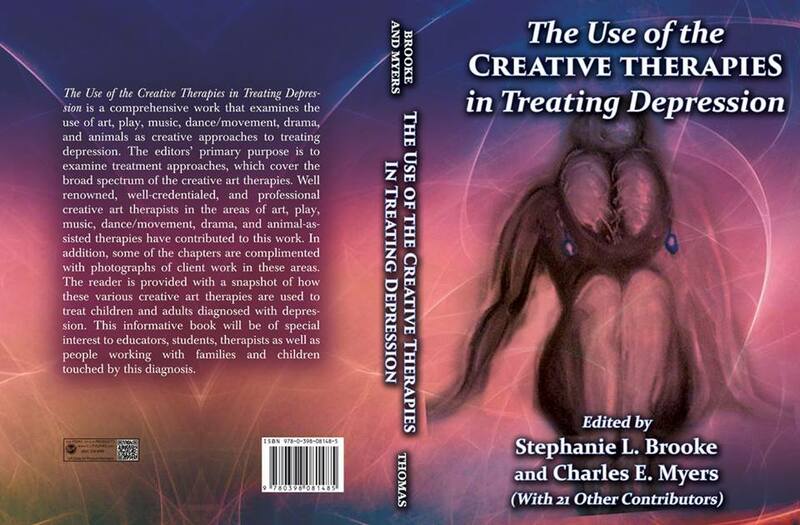 Using the creative therapies in treating depression. Springfield, IL: Charles C. Thomas Publishers. Brooke, S.L., & Straus, T.K. (2011). Domestic violence: An analysis of the crime and punishment of intimate partner abuse. In J. Kitaeff (Ed. ), Handbook of police psychology, (pp. 363-381). NY, NewYork: Routeledge. Brooke, S.L. (2010). Development and mental health issues among homeless youth. PsyCritiques, 55(2), article 5. Brooke, S.L. (Ed.). (2009). The creative therapies with autism spectrum disorders. Springfield, IL: Charles C. Thomas Publishers. Brooke, S.L. (Ed.). (2009). The creative therapies with substance abuse disorders. Springfield, IL: Charles C. Thomas Publishers. Brooke, S.L. (2009). Using the case method in collaborative learning online. In S. McCarthy, V. Karandeschev, M.Stevens, A. Thatcher, J. Jaafar, K. Moore, A. Trapp, & C. Brewer (Eds. ), Teaching psychology around the world volume 2, (pp. 528-549). New Castle, UK: Cambridge Scholars Publishing. Brooke, S.L. (Ed.). (2008). The use of the creating therapies with eating disorders. Springfield, IL: Charles C. Thomas Publishers. Brooke, S.L. (2006). Building resiliency in at risk youth. PsyCritiques, 51(42), article 16. Brooke, S.L. (Ed.). (2006). The creative therapies manual. Springfield, IL: Charles C. Thomas Publishers. Brooke, S.L. (2006). Treating women with depression. PsyCritiques, 51(43), article 13. Brooke, S.L. (2006). Health risks, outcomes, and globalization issues with women. PsyCritiques, 51(30), article 4. Brooke, S.L. (2006). 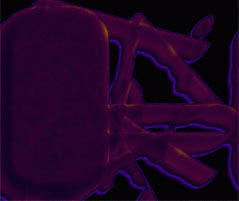 The use of cases in the virtual classroom. International Journal of Teaching and Learning, 18(2), 142-149. Brooke, S.L. (2005). Art connections. PsyCritiques, 50(24), article 12. Brooke S.L., & Martin, J. (2005). Case of Maria and notes. National Study for Case Study Teaching in Science. University of Buffalo, New York. Brooke, S.L. (2005). Origins of the social mind: Evolutionary psychology and child development. PsyCritiques, 50(19), article 7. Brooke, S.L. (2004). Building resilient youth. PsyCritiques, 49(11), article 6. Brooke, S.L. (2004). Critical review of play therapy assessments. International Journal of Play Therapy, 13(2), 119-142. Brooke, S.L. (2004). Teacher sexual misconduct. PsyCritiques, 49(4), article 8. Brooke, S.L. (2004). Tools of the trade. A therapist’s guide to art therapy assessments. (2nd ed). Springfield, IL: Charles C. Thomas Publishers. Brooke, S.L. (1999). Critical review of Assessment of Interpersonal Relations (AIR). Measurement and Evaluation in Counseling and Development, 32(2), 105-110. Brooke, S.L. (1997). Healing through art: Art therapy with sexual abuse survivors. Springfield, IL: Charles C. Thomas Publishers. Brooke, S.L. (1996). Critical analysis of the Self-Esteem Index. Measurement and Evaluation in Counseling and Development, 28(4), 233-240. Brooke, S.L. (1995). Art expression: An approach to working with sexual abuse survivors. The Arts in Psychotherapy, 22(4), 447-466. Brooke, S.L. (1995). Tools of the trade. A therapist’s guide to art therapy assessments. Springfield, IL: Charles C. Thomas Publishers. Brooke, S.L. (1995). Critical analysis of the Depression and Anxiety Scale. Measurement and Evaluation in Counseling and Development, 28(3), 162-167. Brooke, S.L. (1995). Strategic family play therapy: A critical review. The Arts in Psychotherapy, 22(3), 269-270. Brooke, S.L. (1995). Cliff’s GRE studyware package: A critical evaluation. Measurement and Evaluation in Counseling and Development, 28(2), 119-122. Brooke, S.L. (1995). A critical review of Battle’s Culture-Free Self-Esteem Inventory. Measurement and Evaluation in Counseling and Development, 27(4), 248-252. Brooke, S.L., & Ciechalski, J. (1994). Critical analysis of the Minnesota Importance Questionnaire. In J.T. Kappes, M.M. Mastey, & E.A. Whitfield (Eds. ), A counselor’s guide to career assessment, (pp. 220-225). Alexandria, VA: National Career Development Association.